Freeware tool that collects Windows server event logs from computers across your network and alerts on critical events in real time. "There's scads of events you need to keep an eye open for. The tool helps locate them and alert you. If you take your network security seriously, this will help." 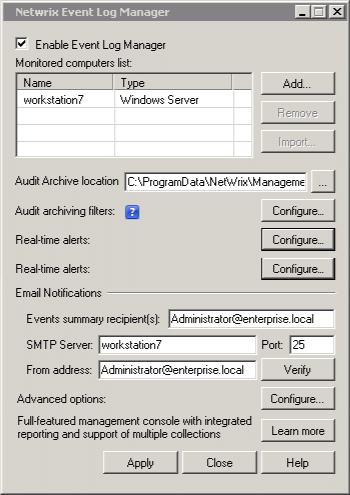 How Much Time Do You Spend on Reviewing Windows Server Event Logs Looking for Critical Events? Consolidates event logs from computers across your network into a central location to facilitate log management. 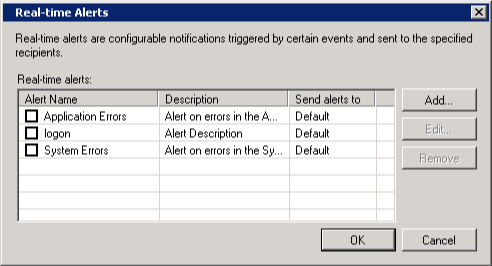 Immediately alerts on event IDs that you define as critical by sending you and other specified recipients an email notification. Compresses collected logs and archives them in a file system so you can get back to them later for further analysis. Eliminates the need to sift through separate logs from multiple Windows servers in your network. Centrally stores all event logs and enables you to easily access them any time you have an audit check to prove that specific processes are in place. Event Viewer from Microsoft enables you to view and manage Windows event logs on your computer, gather information about hardware and software, and monitor Windows security events. However, sometimes the capabilities of this native tool are just not enough. For instance, you need to spend valuable time scrolling through tons of Windows server log files to spot critical events, such as the installation of a new program on a computer in your network or the creation of a new member in your Domain Admins group. But what if those events slip under your radar? Plus, Event Viewer only shows logs on the computer where it’s installed, so you can view events on only one machine in your network at a time, which is highly inconvenient. With Netwrix Event Log Manager, you can efficiently stay on top of Windows server logs across all computers in your network remotely, from a single desktop or laptop. Simply use an intuitive dialog box to specify which machines you need to collect logs from, the file system where the logs will be centrally stored, and the events you want to be alerted about. Then you will be notified in real time via email whenever a critical event occurs on any of those Windows servers, ensuring that no unauthorized activity goes unnoticed. Plus, you can prove to auditors that your logs are being properly archived. "The email alerts are nice and the fact that it can do multiple servers for free from a single system is a great feature. I'll definitely be keeping this in my toolkit from here on."